An abscessed tooth is an infection that affects the root and the nerves that connect the tooth to your gums. Commonly, cases of this follow severe cases of tooth decay. As the tooth becomes damaged, an abscess starts to form. However, other forms of tooth damage such as a chip or a crack caused by a heavy impact on the mouth area can also cause an abscess. An abscess forms when any opening caused by heavy trauma or tooth decay forms on the tooth. This opening makes the tooth vulnerable to bacteria. As the bacteria creeps in, an infection starts to form. When left alone, the infection can spread to the roots of the tooth and can even damage the bones that support your tooth. So when you have an abscessed tooth, you should immediately see a dentist. But how would you know? And what kind of treatment will be done? Here’s what you need to know about an abscessed tooth. An abscessed tooth often leads to a toothache, so your first sign should be pain when you chew. If not pain, then you will surely feel some sensitivity when you drink hot or cold drinks. And because of the infection inside the tooth, the abscess causes a bitter taste and a sour smell in your mouth. You may also experience sensitivity, redness, and inflammation of the gums, especially in the area surrounding the affected tooth. These signs, combined with fever, inflamed neck glands, and an ill sensation certainly points to an abscess in your tooth. However, make sure to go see a dentist even if the tooth stops hurting. In some cases, the tooth’s root eventually dies due to the infection. So even if the infection is still there, the tooth will no longer feel anything, and your toothache will be gone. When you go to a dentist complaining of a possible abscess in your tooth, the first step will be to diagnose whether there is really an abscess. When dentists apply pressure to the affected tooth, you will most likely feel pain. Your dentist will also check your gums for swelling. However, to confirm the diagnosis, you may also undergo a dental x-ray. An abscessed tooth can be treated, though there may be some complications along the way. Complications may arise depending on the extent of damage done to the tooth due to the infection. If the infection has killed the roots of the tooth, the damage to the tooth cannot be repaired. If the abscess is at its early stages, it will have to be drained out by making an incision in the gum tissue where it is located. However, for cases of severe damage to the tooth, a root canal procedure is the best step. 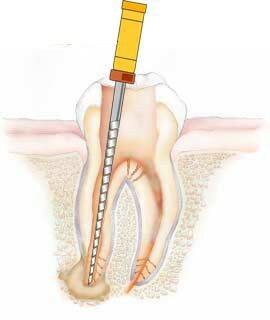 In a root canal, the dentist will access the root and remove any dead root tissue caused by the infection. A root canal is followed by the placement of fillings inside the tooth and of a crown over the infected tooth. In some cases, however, your dentist may need to extract the tooth to be able to completely drain the abscess. After the procedure, you will be given antibiotics to fight off the infection. You may also ask for a pain relief medicine if you are feeling pain or discomfort in the treated area. A tooth abscess, in retrospect, is caused by tooth decay or tooth damage. And just as both of these causes can be prevented, an abscess infection does not have to cause complications for you and can be prevented. To avoid an abscessed tooth, you should observe proper oral hygiene and see your dentist regularly for cleanings and checkups. Thus, your teeth will be clean and protected from decay and from an abscess infection. Proper care for your teeth will also ensure that it is strong and resilient and will not be easily affected by trauma. It is highly recommended that you go straight to your dentist for treatment of an abscessed tooth. However, if you are still waiting for your appointment, you can try some home remedies to ease the pain and discomfort you feel. An abscess may also cause severe pain that can prevent you from eating normally. To ease the pain caused by an abscess infection, gurgle with warm water and salt. You can also try pain relief medications such as ibuprofen. Take note, however, that these are not treatments, but only remedies. It is still important you see a dentist as soon as possible. \ Wisdom Tooth – Is Your Third Molar Causing You Problems? The wisdom teeth usually grows when a person reaches the age of 17-21. Some people do not encounter any problems with their third molars but others experience a lot of pain and discomfort hence the need for removal. Dental Cavity and Caries – What Causes It? The main cause of dental cavity is bacteria. If your teeth harbor bacteria in the form of plaque or tartar, they will eat up on the enamel of your tooth and form a cavity. Getting a tooth filling is necessary if you have dental caries. Bone Augmentation – How It is Done During a Dental Bone Graft, you will be administered local anesthesia to numb the target area. Bone-like material will be added into your jaw bone so that a dental implant can be placed. This procedure is done in your dentist’s office and your dentist will discuss with you all options available.